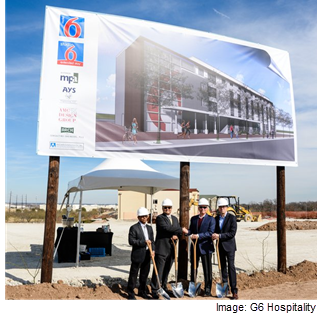 ​​ AUSTIN – Economy lodging brands Motel 6 and Studio 6 began development on a new dual-brand property. The hotel will consist of four floors with 98 rooms along with a large social area. The property is located outside downtown Austin, approximately three miles from the airport. Accommodations will include fully equipped kitchens with microwaves, refrigerators, cookware, guest laundry, expanded cable, Wi-Fi and parking. The hotel is slated for completion in early 2019.